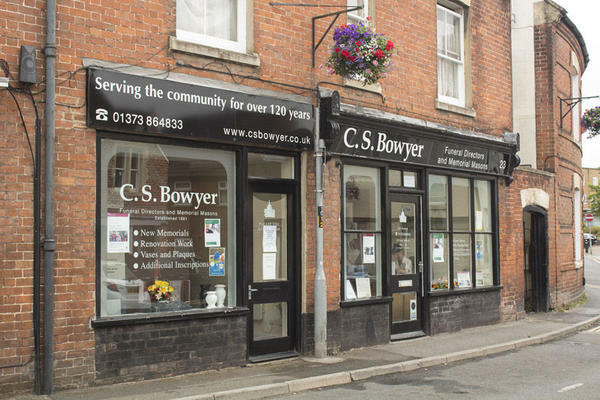 C S Bowyer Funeral Directors in Westbury have been committed to providing the highest standards of funeral care to the Wiltshire community since 1881. Located just off Trowbridge Road, we are accessible from Penleigh, Chalford, Westbury Leigh and Heywood. Our founder Herbert Sydney Bowyer started his first funeral business in Bradford-on-Avon in 1881. Following the success of the first funeral home, expansion followed in the 1980s when the family opened their second in Trowbridge before acquiring our Westbury funeral home in 2012. We do not comprise on quality, which is why it is of paramount importance to us, that we give you an unrivalled funeral care experience. We will take our time to listen and understand you, so we can tailor your loved one’s funeral to your every wish. We can arrange funerals of all kinds, whether it is a colourful celebration of life, a green burial or something simple, we have the skills and expertise to help you. We have a dedicated team on hand to help 24 hours a day; you can call them for support, advice or guidance at any time. At C S Bowyer Funeral Directors, we understand how special life is with those that you love. For us, every funeral is unique and personal. We have a service to fulfil every wish, with every detail carried out with the same uncompromising quality of care. From a traditional service, to a colourful woodland burial, your options are limitless with our Full Service Funeral. If you have a little more flexibility when it comes to arrangements, then we can provide a Simple Funeral for a lower cost. Our staff are available 24 hours a day on 01373 864833 if you require our services outside of these hours. All involved were kind, caring and professional. All aspects of the arrangements were made simple and hassle-free, this made a difficult time a little easier.